What an amazing surprise – Feng Shui Focus won GOLD!! 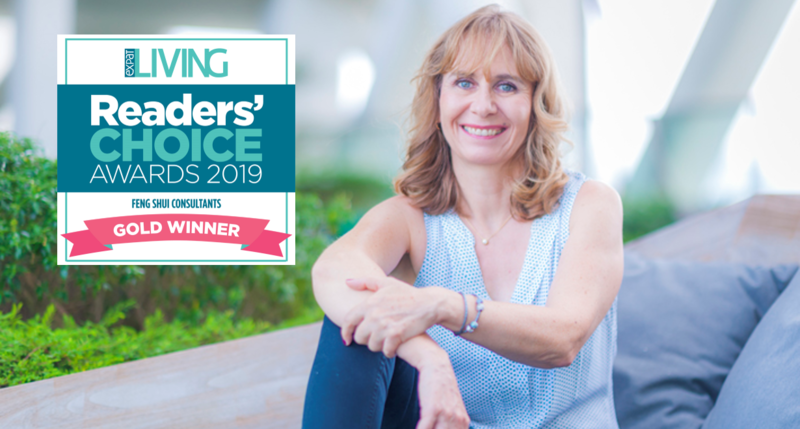 I would like to say a BIG thank you to all my Singapore clients, fans and friends who voted for me in the Expat Living Readers’ Choice Awards 2019. It is such an honour to receive this award and I can’t tell you how happy I am to receive this. What a terrific start of the year! For those who don’t know, Expat Living is THE major publication catering for expats in Singapore (with a branch in Hong Kong). They produce a fabulous monthly magazine, organise most interesting and fun events, and provide a very informative website with info on anything you could possibly want to know about during your stay in Singapore. For a few years running, Expat Living has conducted an annual survey, asking readers to vote for their favourite in all sorts of different categories from A – Z …. Art Pieces, Art Framing, Bedroom Furniture, Hair Coloring, Pet Grooming Services, Supermarkets, Wedding Planners, Yoga Studios … you name it. This time, more than 3,200 readers participated, and you can see this year’s result here. You will obviously see some big names winning first prize in their category, but it is also a fabulous opportunity for small businesses to get noticed and recognised. I am so very grateful for your support, loyalty and your trust. Eight years ago, I founded Feng Shui Focus, and it has been a fantastic eight years of learning, growing and meeting many wonderful clients. This is the first award for my business, and it is an incredible milestone. Eight is truly a lucky number! Thank you again, from the bottom of my heart. You support truly means the world to me!